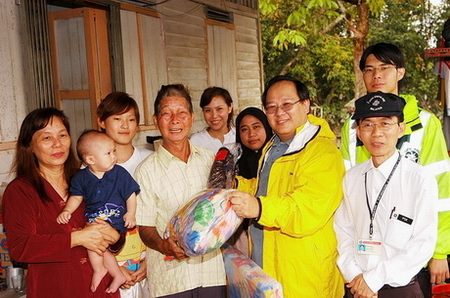 Malaysian Bar Council member Roger Tan (second from right) distributing a pillow and mattress to Sim Hoi Sing at Kampung Tembioh in Kota Tinggi yesterday. With them are other members of the Sim family and Bar Council representatives. KOTA TINGGI: Celebrating the Lunar New Year is the last thing on the minds of the Sim family here. Their first priority is to get back on their feet in the aftermath of the recent floods. "We will make do with what we have for Chinese New Year," said the patriarch of the family, Sim Hoi Sing, 76. "My sons and grandchildren are helping out with the repairs around the house. We are not thinking about any celebrations. We’ll be happy if we can get our house back in order. "All our furniture is ruined but our family is still together. That’s more important to us than celebrating Chinese New Year," said his daughter-in-law, 55-year-old Chai Soi Fah. The extended family lives in a squatter settlement in Kampung Tembioh, which was flooded early this month. Chai, her husband and three children live in one house, and her father-in-law lives with 10 other family members next door. The families have no plans to move. Sim has been here for 40 years. He has a special bond with the place: "All my children and grandchildren were born here. Besides, we have many friends here." Chai feels the same way. Even though, she says, the whole family is now terrified when the sky turns dark and rain threatens. The Sim family is one of 187 families in the village who were badly affected by the floods. Members of the Malaysian Bar Council, led by council member Roger Tan, yesterday gave each household a mattress, pillow and blankets. The team was assisted by members of the Malaysia St John Ambulance Kota Tinggi division, led by its area commander Pok Kim Chan. Tan said the Bar Council had raised RM15,000 to help the flood victims, who heaved a sigh of relief that the heavy rains throughout the state over the weekend didn’t cause a third wave of flooding. District officer Norizan Kulob said the water level in Sungai Johor, the main river which runs through the town, dropped to 0.25 metres below its normal level yesterday. Kota Tinggi recorded 45mm of rain on Saturday, while Layang-layang, Bukit Besar and Ulu Sebol had only 6mm. Most flood evacuation centres in the district have been closed but one was opened in Kampung Sungai Berangan near Ulu Tiram due to heavy rains on Saturday. Only 15 people took shelter as a precaution. As of yesterday, 40,154 flood victims were still in 93 relief centres, all in the Batu Pahat district. A spokesperson at the Johor Baru flood operations centre said the water in Batu Pahat was receding and many had returned home.